A bit of a change for our heroes this time. Sapphire and Steel arrive at a suburban home to deal with an incursion by time. They meet a normal family – son on holiday from university; daughter still at school and coming into her womanhood; and their widowed mother. All seems to be ordinary, but why does Brahms Lullaby keep playing and why does the television seem to be attempting to communicate… As the story progresses, Sapphire and Steel face death and danger and uncover secrets going back 16 years. Finally, Sapphire and Steel have a hard decision to make that will affect the family deeply. In the audio plays, it’s possible to see the writers struggling with the format – trying to break away from the set up put in place by the television series. Whereas the television series portrayed isolation by making the settings fairly isolated from everywhere else (the remote farmhouse, a railway station, a filling station by the side of the motorway), the audio plays have more range – the steam train is clearly isolated, but this has a suburban house as the setting: showing that you can be alone even in a large crowd. The characters also show their isolation (and we will see this recurring motif in later episodes) – the family secrets, Philip Burgess with his own secret in 1.1. Something I didn’t touch on in the first episode – the musical score. Music is very important to the script, not just the Lullaby playing throughout, but also a song written for the episode – a deep, dark song about suicide. It all combines to make the family home – a place that should be full of light and happiness – a very dark and threatening place to be. As with the first, and later, episodes the music combined with the script and the acting make the sets come to life. You really do not need to have the visuals in front of you to “see” the action. The actors are to be commended for this episode – Warner and Harker are both settling into the roles more and more. It means that they are making the characters their own, rather than being copies of the originals. As the episodes continue, it becomes harder and harder to imagine Joanna Lumley and David McCallum playing the parts. As we will see, the audio plays do not shy away from tackling hard issues and while they may not come up with any real answers to them, the plays do portray them quite bluntly. Buy it here or get all of season 1 here. 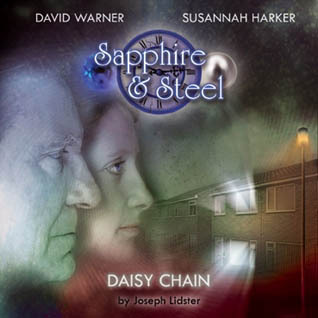 Posted on 21 May, 2010, in Sapphire & Steel and tagged big finish, david warner, detective, family, ghosts, regret, sapphire, sapphire and steel, steel, suicide, susannah harker, tragedy. Bookmark the permalink. 1 Comment. Music can really set the tone and feeling for any good show or movie. Some of my favorite movie's including soundtracks that really keep you captivated and interested during the show. The Mario Bro's games have done a great job of this as well.